Haha, well this might be taking things to a whole new level here. To be honest, I'm not really even sure if I'll ever run this, even just for testing purposes, since it seems quite a bit time consuming to put it best lol. 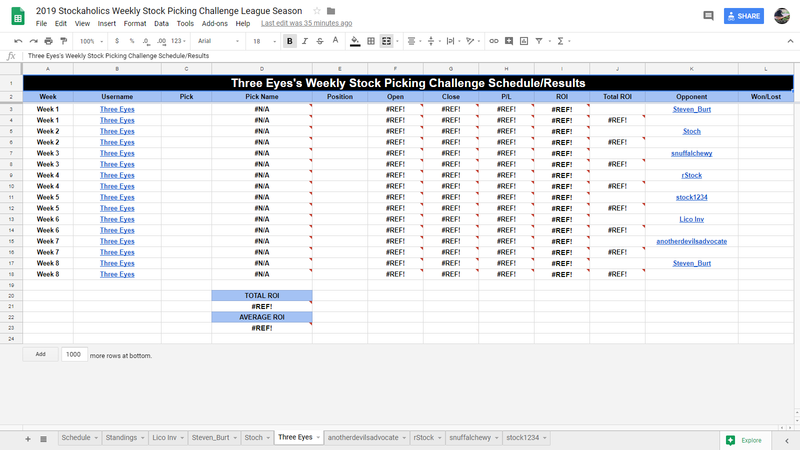 But, what about a weekly stock picking challenge league season? Basically, if any of you are familiar with how the NFL season works, that's essentially how I'm formatting this off of. For example, we have a total of 8 teams (or participants in this case) that face off against each other in an 8-week season. 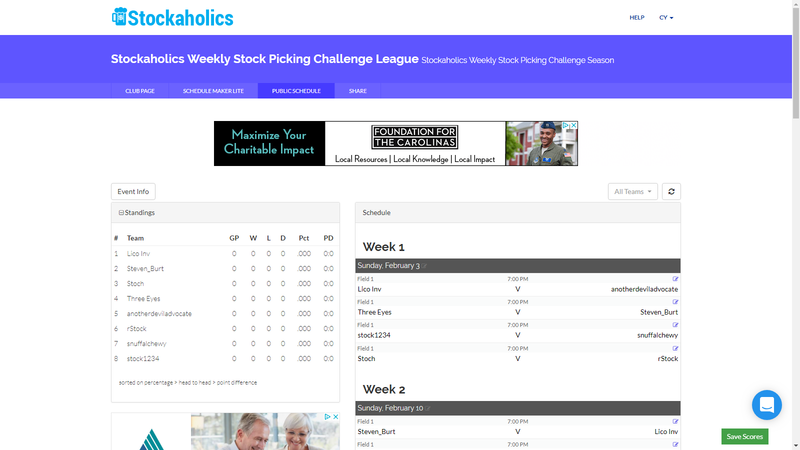 The nice thing about where I'm running this is that is also comes with a standings, so all I'd have to do is simply input the weekly scores and it would do the rest automatically which would be a huge time saver. Anyway, here's a screenshot I took if you guys are curious exactly how this would look. What do y'alls think of this idea? I guess it would help if I posted the link to the page where I'd be running this. Every week participants would play a new participant. So, it's not like you're playing the same person each week for the entire 8 weeks lol. That changes every week. Participants would only play each again in the last week of the season (Week 8). Hmm, expanding on this idea a bit more, perhaps I can run this trial run league season via Google Sheets as well for easier tracking? Here's one that I just whipped up this morning. Whatcha guys think of this one so far? 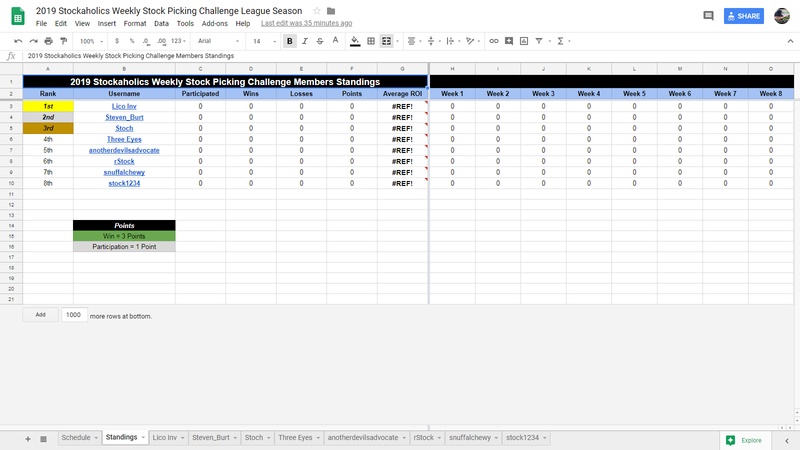 ^^ Oh and just in case anyone was wondering, the league challenge would have participants making only 1 pick per week as opposed to the regular 2 picks on our other weekly formats. OK, so I had some free time on this afternoon with the markets closed today. I'm actually kind of itching to give that league challenge a one or two week trial run here, just to see how it would all work out if I did decide to run in on here at some point this year. I went ahead and setup the @Three Eyes vs. @Steven_Burt match-up for this week. Here are the form links to submit picks. Keep in mind that I have not tested any of this out, but I think it should work. I'm kind of interested to see if this will actually work out or not haha. BTW, disregard this post! I've decided to make this league challenge 2 picks per participant just like our other formats. Guess I'll go ahead and create the other Week 1 games as well. Here is @stock1234 vs. @snuffalchewy for this week. Thanks as always @rStock much appreciate it. I think I probably should have created a brand new thread for this league trial season because it doesn't look like anyone submitted their picks (for the exception of you of course ). Or perhaps I didn't give people a lot of time or a heads up about this league idea. What I can do is just copy members picks from our regular weekly contest thread to here again. Glad to see it is working for you though! I'm gonna be giving this team playoff challenge a test run starting for this upcoming week ahead. This is going to be a best of 5 weekly series, with the team winning the first 3 weekly challenges advances to the final round. Here are the groupings for each respective teams. Unfortunately, I had to leave a few members out (myself included) for this playoff trial run due to some grouping issues, sorry about that! I hope to have this corrected on our next test run though. So, w/o getting into further ado, here are members and their teams with their respective forms to submit for this week! I'm hoping I've got everything setup properly with the Google forms and sheets and that it's functioning correctly. Remember, the contest rules for this team challenge is exactly the same as our regular weekly picking contests. Participants can close out picks at any time during the trading day, but they must be posted to this thread here. 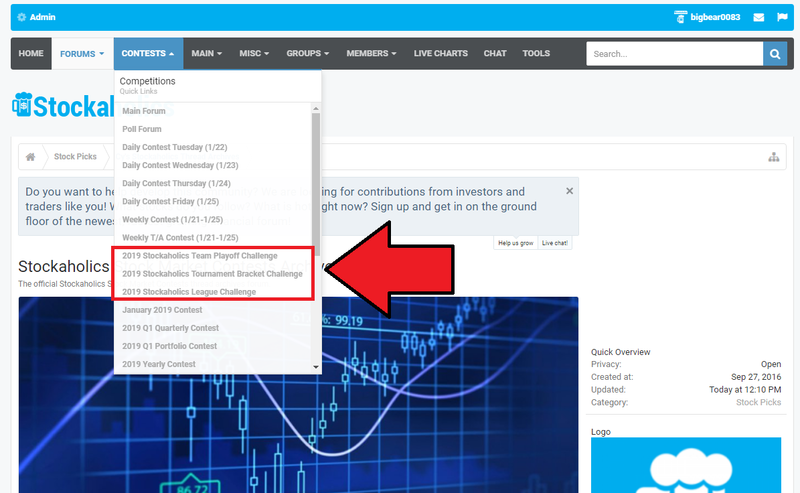 GTLA this week in this first weekly challenge of this best-of-five weekly series! 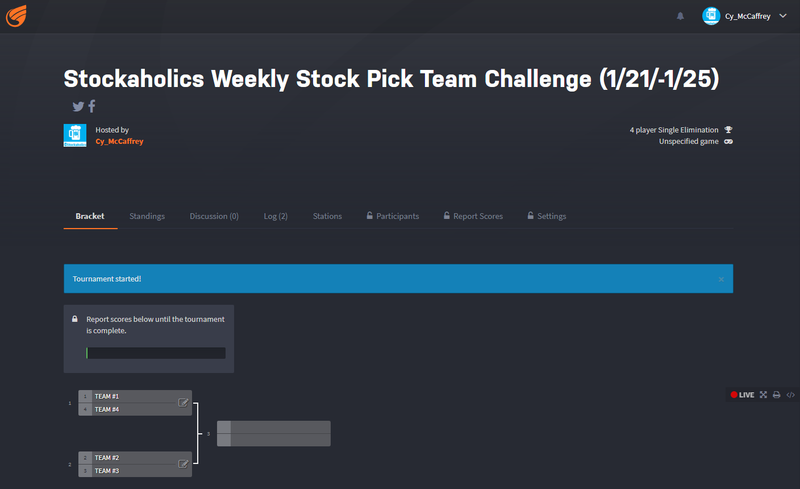 BTW, @rStock don't forget to submit your picks for the team challenge this week as well. I know this is getting to be a little overwhelming on the number of different competitions for you guys haha. My bad. Yeah, I think that is good idea too. 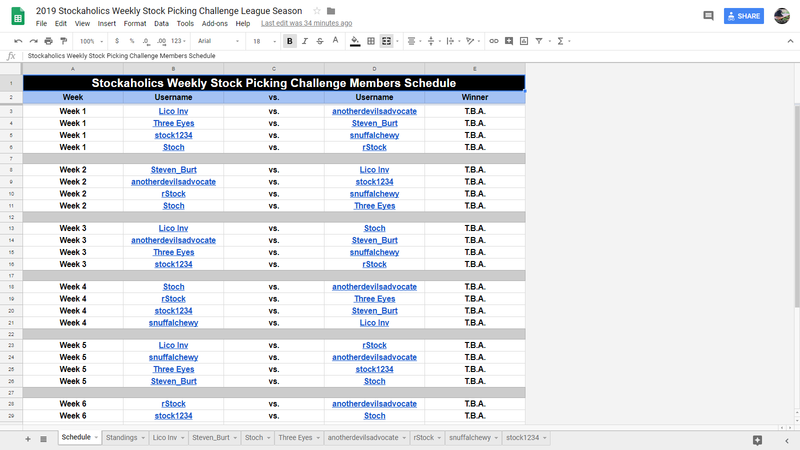 The only reason I'm doing it via the form is so I don't have to input picks into the spreadsheet manually haha. Just a quickie heads up in here! Due to the absence (or no pick) form @anotherdevilsadvocate this week, I will instead be putting in @emmett kelly in for this league challenge trial run. So, @Lico Inv will be up against @emmett kelly for this Week 1 match up. Also, since quite a few did not submit picks via the form links here, I'll just simply copy picks from our regularly weekly contest. So, I guess I forgot to announce this yesterday and I'm not sure if anyone had noticed, but I went ahead and split this thread into 4 threads. I didn't feel like creating completely new posts for each thread, so to save on the time I just moved the posts that were made in that first linked thread above to their respective threads. I always felt like we needed separate threads for those other contests that I'm test running and didn't like that we were using the same thread from last year for everything. Anyway, I also added those thread links under the "contests" tab on the navigation bar at the top of the forums in case you guys have trouble finding the threads. Oh and BTW, I think if all goes as planned (meaning if I'm able to complete all 8 weeks of this league challenge) then I think the "tournament bracket challenge" would be a nice finish for this league challenge. It will be just like an NFL season, albeit in our case it would be an 8-week season, not 17-weeks, and then you have the 1 vs. 1 playoffs, with the lowest seed playing the highest seed in the regular season standings, until a champion is crowned. Whatcha guys think about that idea? So Week 1 is in 2 weeks from now (Feb.3)? Haha, actually Week 1 has already gotten underway this week. That being said, I may need to put this one on halt, or even restart it from scratch again as I know not everyone was aware of this contest, in addition to the # of different competitions that we're already running in here which may be getting a bit overwhelming for everyone haha. I'll see how it goes by the end of this week and will make a decision at that point. For now though, I plan to run this to its completion. Just wanted to give everyone this quick heads up in here, but I am thinking of calling off this league challenge for the time being, since we've already got the team playoff challenge going for us right now, and we will soon be starting up the community challenge at the beginning of next month. It would seem like running this league challenge right now might just be a tad bit excessive for us at this time. I'd like to trial run this for a full 8 weeks uninterrupted when we don't have so many other challenges going on at the same time. I'll revisit this thread in a couple of months. I think it is a cool idea, but it would be better served to run this when things are a little dead (as far as the number of other comps going on that is ). Will update this thread with the Week #1 results a little later this evening or this weekend if I have time so you guys can at least get some idea how this would all look and work when I do finally decide on fully trial running this in a couple of months.